The dueling machine, the perfect pacifier for all man’s tensions. You could enter a world of your own creation, destroy your enemy or be destroyed by him, and emerge from your mental fantasy world completely unharmed. Dr. Leoh, creator of this ultimate placebo, could not believe that someone had now found a way to use his machine as a tool for destruction. But apparently someone had. And now this someone, Dictator Kanus of Kerak, was using the dueling machine to conquer the Acquataine Cluster. Leoh realized it was up to him to stop Kanus before the man began a war of conquest against the Terran Commonwealth and Star Watch. But how, equipped only with an eccentric and bumbling Star Watch Lieutenant and the dueling machine itself, was he to accomplish this? And even if Leoh could discover how the dueling machine was being turned into a death machine, could he stop Kanus and his cohorts before civilization ended in an intergalactic war? And you’d be right to say that, although I just looked it up and it turns out his six Hugos are for editing at Analog, not writing, so bleah. Still, he’s a skilled writer with more than 120 books to his name (according to his own website). He doesn’t deserve to be made fun of. I picked this book this week because I wanted to read something good. 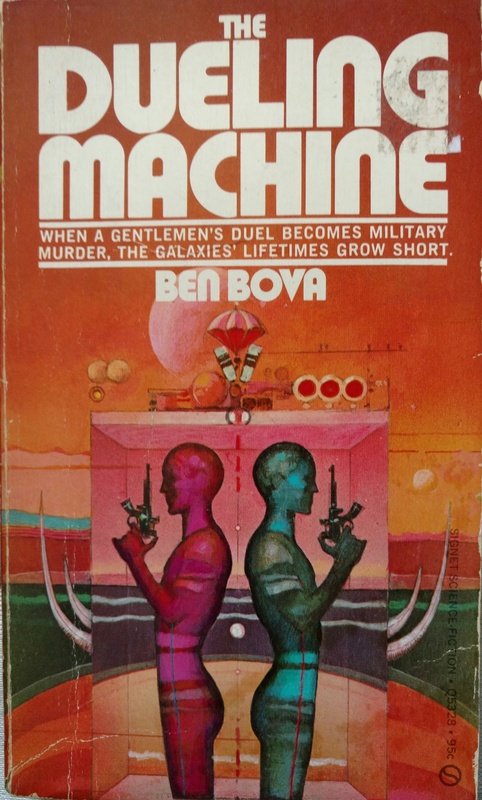 I wanted a decent guarantee that that would happen, so I grabbed this Bova novel that showed up in a Joachim Boaz care package. The thing is, I remembered reading this one once before, so this review is all wrong in at least two ways now. Still, I read it in the eleventh grade, I think, so it’s been at least fifteen years. As an experiment, I wrote down what I remembered happening before I started reading, just to see how well I remembered things. There’s this machine, right? And people use it to duel in. Nobody ever gets hurt, until, surprise, some people start to get hurt. Oh no! You know what? I nailed it. Not really. There’s a bit more going on. I also thought there was a bit more going on than there was. I didn’t write it down but I had this sneaky feeling that there was a plot point in this book about guilt. Like the machine could be used to make a person feel an augmented sense of guilt for doing bad things. I could have sworn that was a part of this book. But it never cropped up. There is no guilt manipulation in this novel and I have no idea where that idea came from. Did I make it up or am I confusing it with another book? Please, if you have any idea, let me know. I said I wanted to read something good this week, and while The Dueling Machine was indeed good, it had some things that just felt odd to me. The plot took some astounding leaps, for one thing. I’ll get to that in a minute, but after a while I realized that this probably has something to do with the book originating as a short story (or novella?) and then being expanded on, so that makes it a bit more okay. Our heroes are Dr. Leoh and a guy named Hector H. Hector. I don’t like it when people have the same first and last name, especially when they might also have the same middle name. It comes across as forced to me. Anyway, Hector is a Junior Lieutenant with the Star Watch, which in turn is your typical space cops slash paramilitary force. Leoh and Hector get called to a world in the Acquataine Cluster called Acquatainia. Acquatainia has got a problem. For one, their space-neighbors, the Kerak, are warmongering all over the place and are looking to get their grubby hands on more territory. For two, the Kerak sent this guy, Odal, to represent them, and he’s obviously up to no good. He’s found a way to make the Dueling Machine kill people, something that it’s very definitely not supposed to be able to do. The titular Dueling Machine is great. Just a flat-out good idea and basis for a story. I’m not being sarcastic. I love this. What the thing does is allows two people to enter a virtual reality (those words are never used) created to their purpose and then fight it out. Anything goes. According to the rules of the game, the person who gets challenged is the one who gets to name the setting and the weapons used for the first round. If the first round doesn’t come out in anybody’s favor, the challenger gets to do the same thing. Stuff used in the course of this book include starships, race cars, big clubs, swords, and the laws of physics. For that last one, Dr. Leoh constructs an elaborate maze out of basic physics principles like levers and pendulums and then uses them to demolish his enemy. It’s great. The whole point is that nobody really dies. Yes, they feel pain, but injuries aren’t permanent. Two people can work out their aggression toward one another in a way that is safe and thus civilization is saved from human nature. That’s how it’s supposed to work. It turns out that this Odal guy is going around Acquatainia challenging high-ranking members of the government under the pretext of being insulted by them. The two enter the machine and then Odal manages to make it kill the other person. The first time this happens, it’s to a guy named Dulaq, who is merely rendered catatonic. Everybody else dies, though. Why didn’t they shut down the machine after the first time something bad happened? Seriously, government, you’re going to let like four people die before you decide to do anything about it? So the government called Dr. Leoh. Leoh invented the Dueling Machine. He’s assisted by Hector of the Star Watch. At first Leoh can’t find anything wrong with the machine at all. It’s just as it should be. He and Hector enter the device a great many times in an effort to figure out what’s going wrong. Neither of them can figure it out. When it comes to characterization, this book is what I’ll call Sixties Pretty Good. Dr. Leoh is the Wise Old Man. Hector is the bumbling but enthusiastic kid. As time passes, though, Hector grows into himself and starts to do some important things. One of those things comes when Odal starts to challenge Leoh to a duel. Before Odal can finish the challenge, Hector upends a pitcher of water over the challenger’s head, thus interrupting the duel challenge with another duel challenge. It turns out that the reason Odal can kill people is that he’s psychic. I didn’t see that coming. At first I felt like it was a bit of a cheat. It turns out that there are psychics, although they are rare, and it also turns out that the Dueling Machine can enhance their abilities. How does Odal manage to turn this to his advantage? All he does is use his powers to duplicate himself and deliver a beating so harsh that it renders the opponent catatonic, or gives them a heart attack, or whatever. Wasn’t thrilled with that reveal. Hector, it turns out, it also psychic. This comes up a bit later. In the meantime, though, he and Leoh manage to find a way to fend off the psychic attack and make Odal go away. The war is averted, except that we’re only a third of the way through the book. But here is where the original magazine version ended, and so the rest of the book felt pretty tacked on. Part two has Odal using some convoluted plan to…make Leoh famous? Leoh ends up doing some duels with various people, mostly using his crazy physics setting, and everybody grows to love him and know that the Dueling Machine is safe again. So Odal shows up again and completes his challenge. The two men fight and Leoh wins. Everybody’s all like “Oh man Odal’s gonna get it” but then it turns out that it was his plan all along to make the Acquatainians not fear the Kerak as much, or something. There’s a second plot in this part where Hector’s new girlfriend, Geri, is trying to get Hector to kill Odal for reals. She gives him a gun and everything. Turns out her dad was Dulaq, the first guy Odal went up against in the Dueling Machine. He was mentally injured and eventually died. She wants revenge, Hector doesn’t want to lose his first ever girlfriend, and it’s a boring subplot until it comes to a head. It turns out that Hector just can’t do it in the end and Geri gets all mad at him, but it also turns out (there’s a lot of “also turns out” in this book) that Odal just starts talking about his and the Kerak’s evil plans for a while. Big villain speech, you know the sort. It also turns out that somewhere in there Hector managed to turn on a microphone, so now the whole villain speech has been broadcasted to the whole planet, and Odal is busted again. And then we get part three, which was the best one. It was another huge leap of logic, though, that started this one off, and it bugged me at first. It turns out that, pretty much out of nowhere, psychics who use the Dueling Machine can also use it as a teleporting device? I’m just gonna let that sink in for a moment. For reasons that I don’t think were ever explained, people with psychic powers can use the Dueling Machine to teleport to another Dueling Machine, no matter where it is. I guess this has something to do with the fact that Dueling Machines enhance psychic powers, but still, this is a weird twist. The good part of this section, though, is everything else. We find out that the Dictator of the Kerak, Kanus, isn’t doing so hot. He’s insane. Completely and utterly. It also turns out that there is an active resistance against his rule. There’s a set of people who know that Kanus is trying to start a war with the Terran Commonwealth, a war that he will certainly lose. His people don’t want that. We also learn that Odal is being punished for his failures by Kanus and is being forced to use the Machine for teleportation purposes. While researching the same thing, Leoh manages to make Hector and Odal swap places. After some adventure they get Hector to teleport home, but this time it’s different. For some reason he ends up having a mind meld with Odal? Each man sees the other’s past and personality and, most importantly, we get some exposition about the guy who’s been the villain this entire time. It turns out he’s not that much of a villain. He was doing what he thought was best for his homeworld and, while under duress, doing some pretty terrible things for his leader. A plan is hatched. The teleporting Dueling Machine is used to get into Kanus’s palace. Kanus is captured. Celebrations are had. The book ends by telling us that Leoh has found a way to repurpose the Dueling Machine to use as a therapeutic device. Kanus is the first patient and his condition is improving. Everybody is happy. The thing I liked most about this ending is that nobody died out of any kind of revenge or anything. That might sound corny but bear with me here. It is (or should be) a cardinal rule of writing that the villain is the protagonist of his or her own story. Nobody is going around saying “Yes! I love eeevil!” in a way that will come off as convincing. This book started out by presenting the Kerak as the bad guys. They were a solidly evil race, bend only on conquering the galaxy. They were led by Dictator Evil of the Evilons, and all they did was evil. The ending, though, shows us that we were only getting one side of the story. Not all the Kerak were evil. Most were just people. Not even the entire Kerak military was evil. Some of them were willing to sacrifice their lives and careers to fix things. And then, in the end, it turns out that not even the Emperor was all that evil. He was sick. And his sickness didn’t earn him a laserbolt to the head. It earned him rehabilitation. It earned him mercy. That’s an ending that I don’t think I’ve ever seen before. I am floored. While the book had some weird jumps of logic, on the whole is was great. The characters were so well-formed. Ever read a book and just hear the characters’ voices in your head and you’re reading them? That doesn’t happen to me a lot. Usually most characters’ voices are just variations of my own. This book was not like that. I was amazed at how clearly their personalities came through to me, although I will admit that all of those voices would have been right at home in a sixties-era Roger Corman movie. I’m really glad I picked this book up again. I feel like High School Me wouldn’t have appreciated it as much (evidenced by the fact that I only remembered the title). I want to read more Bova, now. Based solely on this book, his writing has a certain humanity that can be missing from science fiction, especially from the sixties. Maybe I’m wrong and this book stands out for some reason. I’m really interested in finding out.